North Yarmouth, ME - On Friday, December 22, 2018 Paul S. Leighton, loving father, friend, brother, and son, passed away at home at the age of 55. He was born in Portland, ME on June 19 1963 a son of Mary Gladys (Bernard) Leighton of Pownal, and the late Harvey Leighton. Paul attended Freeport High School. He was previously employed by MSAD51 where he was a custodian for the last 15 years. Paul was a very caring and supportive man. His charm and thoughtfulness reflected in the lives of those who surrounded him. He was quick to take in those around him, whom he knew needed just a little more guidance to help them attain their potential. 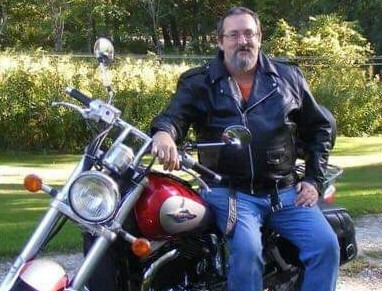 Paul enjoyed spending his free time with his family; whether it was spent riding his motorcycle with his brother Ken, or having a beer with one of the many friends and family needing a good laugh or thoughtful chat. His unique and inspiring personality could brighten any mood. Paul is lovingly survived by his beautiful bride of 37 years, Sharon Leighton. He is also survived by his loving children, Shane Leighton of North Yarmouth, Nicolé Leighton and her husband Phillip of Rumford and Amber Gerding, and her husband Dominik. He also leaves his close family friend Victor Hilton of Rumford. Paul was also an amazing Papa to his many grandchildren; Hunter Gerding, Logan Gerding, Mason Gerding, Miranda Azcona, Kristian Azcona, Holden Azcona, Amberlin Azcona, Kiyanna Davis-Peavey, and Marcus Davis-Peavey. Paul is also survived by his siblings Coramarie Rose and her husband Dale of Pownal, Brian Leighton and his wife Carol of Pownal, and Ken Leighton and wife Kathy of Lisbon, as well as countless more loved ones. Relatives and friends are invited to attend a memorial service on Saturday, January 12, 2018 from 2 – 6 p.m. at the Cornerstone Lodge, 22 Poland Street, Portland, ME.